Mary Stuart tickets are now available! Robert Icke's new adaptation has transferred to the Duke of York's theatre and promises to be one of the most talked about shows of the season! Following a critically acclaimed, sold-out season at the Almeida Theatre in 2016-17, Robert Icke’s new adaptation of Mary Stuart transfers to the Duke of York’s Theatre in London’s West End from 15 January for a limited run. 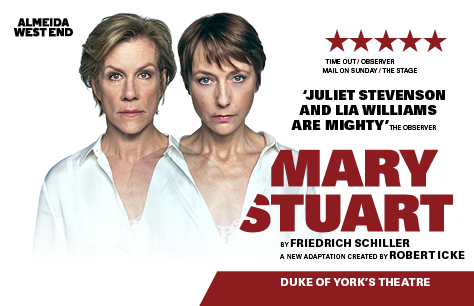 Book your Mary Stuart tickets in advance to avoid disappointment! Electrifying performances by both the leading ladies. Only, slightly off-putting was the fact that a number of the male actors were wearing rather "clumpy" shoes that resounded on the wood floor of the circular stage. ABSOLUTELY MESMERIZING AND BREATH-TAKING, GENIUS IN ITS SIMPLICITY, THAT IS THE RESULT OF PROFOUND UNDERSTANDING, TOUR DE FORCE OF DIRECTING AND ACTING, UNFORGETTABLE STAGE IMAGES - CHALLENGING TO BOTH PERFORMERS AND AUDIENCE - AND ALTHOUGH WRITTEN IN THE 18TH CENTURY, IT'S TOTALLY RELEVANT. UNFORGETTABLE - BRAVO!